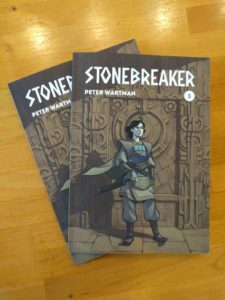 Stonebreaker Part Three is now available in my store! This book consists of chapters three and four, along with a few pages of development sketches (as usual). Parts one and two are up there as well, if you haven’t picked them up yet. I’ve almost sold out of them, which is awesome (and thanks so much to everyone who’s picked up a copy! ), but I’ll probably do another print run before too long. Anyway, back to drawing the next chapter for me. Thanks for reading!